The new QHHT® website is designed to provide an official location for information about QHHT® courses and sessions for prospective QHHT® Practitioners and to give QHHT® Practitioners a platform to share their experiences. The new QHHT® website also features the official QHHT® Practitioners Portal and QHHT® Practitioner Forum. Dolores Cannon developed her unique technique of hypnosis, QHHT®, as a tool to access the lost knowledge that her insatiable curiosity craved to know and share. Through her books, Dolores continues to take us on journeys to our distant past, to worlds in the future, and to witness creation in all its vast and mind blowing forms. Dolores began teaching her QHHT® courses in 2002. In 2013 her Level 1 QHHT® Course became available online, and we continue to teach her Level 2 QHHT® Course and the newly introduced Level 3 QHHT® Course in person around the world. 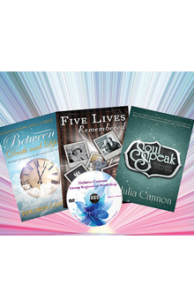 Through QHHT®, Dolores Cannon is helping people to heal themselves and helping others to do the same. It’s an amazing and wonderful process to watch unfold. Although information about QHHT® will remain on Dolores Cannon’s website, http://www.dolorescannon.com, Dolores’s online presence is the official source for her pioneering research of lost knowledge, metaphysics, the paranormal, ET/UFO investigations and so much more. Dolores’s unparalleled investigations into the unknown are the subjects of her 19 books; new books will continue to be released by Ozark Mountain Publishing, which she founded in 1992. Dolores Cannon’s books to date include Five Lives Remembered; Conversations with Nostradamus, Volumes I, II, III; Between Death and Life; Jesus and the Essenes; They Walked with Jesus; A Soul Remembers Hiroshima; Keepers of the Garden; Legacy from the Stars; The Legend of Starcrash; The Custodians; The Convoluted Universe: Books One, Two, Three, Four, Five; The Three Waves of Volunteers and the New Earth and The Search for Hidden Sacred Knowledge. Thanks to Dolores Cannon, we can travel to every place and time in history and even visit other dimensions, planets and universes! Dolores transitioned from this world last year to continue her amazing journeys on the Other Side. Dolores is greatly missed, but she is helping us every step of the way as needed.